Kishangarh is an erstwhile princely state founded by the Jodhpur prince Kishan Singh in 1609. Located at the centre of this now bustling town is the Kishangarh Fort, enveloped by the Phool Mahal Palace and the Gondulav lake beyond. The Fort, built in 1649, is an epitome of the Rajput and Mughal styles of architecture. Located at a distance of about 27 km from Ajmer city, the fort is outlined by nine turreted fortifications which house several battlements, granaries, armories, jails, and foundries. The double storied Durbar Hall has latticed windows above from where the queens could view the proceedings below. The fort is enveloped by a thick wall which makes it one of the most formidable forts of Rajasthan. It was within the walls of this fort that the distinctive Kishangarh style of painting flourished in the 18th century. This art in its heyday had a unique ethereal, almost mystical quality. Its influences were deeply steeped in Radha Krishna bhakti and the splendour of the natural beauty around the environs of Kishangarh in Rajasthan. Historically, the Indian artiste has always been an artisan. Examples of this can be found in the shilpashastras, with the idea and creative inputs of the patron combining harmoniously with the skill and talent of the artist to produce works beyond worldly beauty. One of the greatest examples of this can be seen in Kishangarh between the master artist Nihal Chand and Raja Sanvant Singh (c. 1748-64), where in a brief span of thirty years and new dimension of expression and an atelier evolved. This culminated in India’s most celebrated miniature paintings of “Radha” (referred to as the Mona Lisa of India), and believed to be a veiled allusion to the Raja’s beloved Bani Thani, a singer and poet. This illustrious form of miniature paintings declined over the years, suffering at the hands of lack of devotional fervour and creative desire among artists. However, in 2010, Princess Vasihnavi Kumari of Kishangarh, a graduate of the National Institute of Fashion Technology (NIFT) Delhi and a student of Scandinavian and Renaissance art at the British Museum, founded Studio Kishangarh as an effort to inject new patronage in the traditional art form of miniature paintings. The art studio is based modelled after the painting ateliers of the 18th century and is an amalgamation of old aesthetic and techniques with new materials and concepts. Housed in Phool Mahal Palace at the foot of the Kishangarh Fort, the space gives the artists an ideal inspirational environment to work in. Taking inspiration from conventional Vaishnav themes like pichwai paintings, the leela of lord Krishna, temple decor and items used in shringar of deities, the studio designs and develops art, life style products and apparel. The studio provides employment and patronage to local miniature painters many of whom have had this vocation in their families for generations. Livelihood from this project fuels the rural economy in areas where livelihood generation is limited. The studio collections have included the Sacred Cow series, a glorification of Kamdhenu, the iconic symbol of wealth, strength, abundance, selfless giving in Hinduism. Their current collection, titled “The Shri Nathji Series”, is an exploration of mixed-media art work on canvas and pays homage to Lord Krishna in his form as Shrinath Ji, a manifestation worshipped mainly by the followers of Bhakti Yoga and the Vaishnavas in Gujarat and Rajasthan, among others. 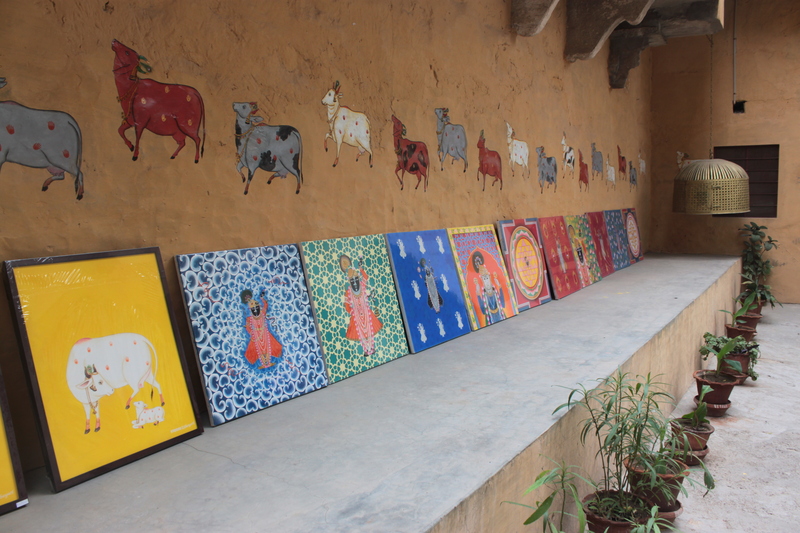 Each art work is exquisitely hand-painted and aims to give a different expression of devotion in each of the paintings. As the studio continues to introduce new ideas to revitalize traditional art, there is much to wonder at and appreciate in the preservation of this centuries old legacy. Posted in Art, Artist, Crafts, History, Monuments, People of India, Rajasthan, Revival and tagged art, Fort, History, Kishangarh, Lord Krishna, mughal, Painting, Palace, rajasthan, Royalty, studio. Bookmark the permalink.